It's Tuesday, you're feeling lazy and you're craving flavor. It's Thursday, the weekend is in sight, and it's time to share a feast with friends. It's Saturday, you're ready to splash the cash and go big. 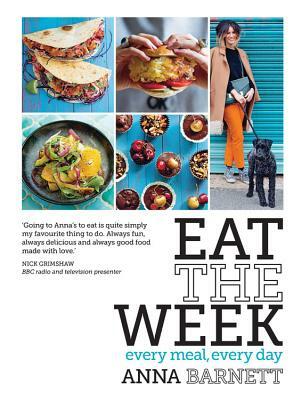 Eat the Week is stylish, practical, and personal. Anna Barnett has devised creative recipes inspired by our different moods as we navigate the week. There's everything from weekend brunches and comforting dishes packed full of carbs, to nutritious salads and zesty Asian noodles for when you want something lighter. Plus cheats, insider tricks, and imaginative ways to work with leftovers. On Mondays it's all about simple dishes, healthy-eating resolutions, minimum fuss, and robust flavors; on Saturdays, when you have more time to shop and cook, things get a bit more extravagant. Anna Barnett has worked as an event organizer, a celebrity booker for MTV and PA for Kelly Osbourne, but food has always been a passion. Anna writes a weekly column, "The Reluctant Vegetarian," for the Independent and runs her own blog at annabarnettcooks.co.uk. She regularly turns her house into a pop-up restaurant and has been extensively featured in UK food magazines and national press.